As we've all noticed, the battery life in the m7206 is terrible. It lasts about 40 minutes out of the box. It can be improved somewhat by disabling the phone process running in the stock firmware but it is still only 60-90 mins max. Replacing the battery with a higher capacity model is quite easy and it will give you a massive improvement in battery life. I can't link to it here as it's against the rules. stated on the ebay auction/website that you purchase it from. process in the stock firmware. battery life with wifi turned off, more if you turn down the screen brightness. WARNING: Lithium Polymer batteries are EXTREMELY volatile, so take your time and be careful when replacing it. Do not accidentally puncture the battery pack, and do not short the wires coming from the battery or the connections on the board. The battery used in this tutorial is 3.7V. if you use this tutorial for a similar tablet, make sure that the battery is 3.7V and not 7.2V. sure of the correct one to purchase. 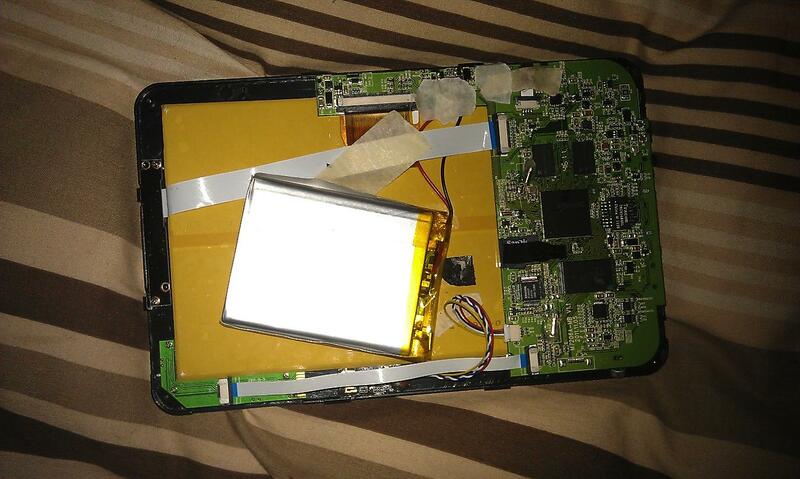 Step 1) To open the casing, you need to remove 4 small screws located in the 4 corners of the tablet. To get at the screws use a scalpel/razor blade or a small flat screw driver to lift the black sticker in each corner of the tablet. Don't completely remove the sticker because it will be difficult to put it back correctly if you do. Once you have removed the screws, use a credit card or a flat blade screwdriver to slide into lip around the edge of the tablet. Use it to pop the front of the tablet out of it's casing bit by bit, working your way around the edge. You can see in the photo above that the 2 wires coming from the battery are soldered to the mainboard. positive(red) wire and tape that also. think that it's putting too much pressure on the screen you can slide a sharp blade under the battery to cut the tape. If you decide to use the blade, be careful not to cut or puncture the battery! the old tape, or you can attach it with new double sided tape or silicone rubber if you have it. Here's a photo with the new battery in place. There's still room for an even bigger battery. 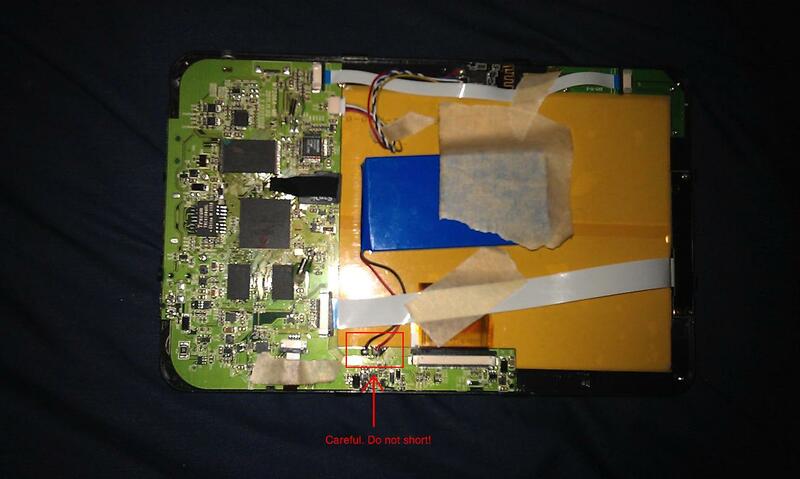 Your can see the PCB that protects the battery under the yellow transparent tape on the right hand side of the battery. Step 3) Now you need to charge up your new battery. I suggest you leave the tablet open so that you can watch the battery for it's first charge. Nothing should go wrong, but it's best to be cautious with any new lithium battery. hot to touch, disconnect the charging cable immediately. The battery will take a few hours to charge. Once the red charging light goes out you can put the tablet back together. 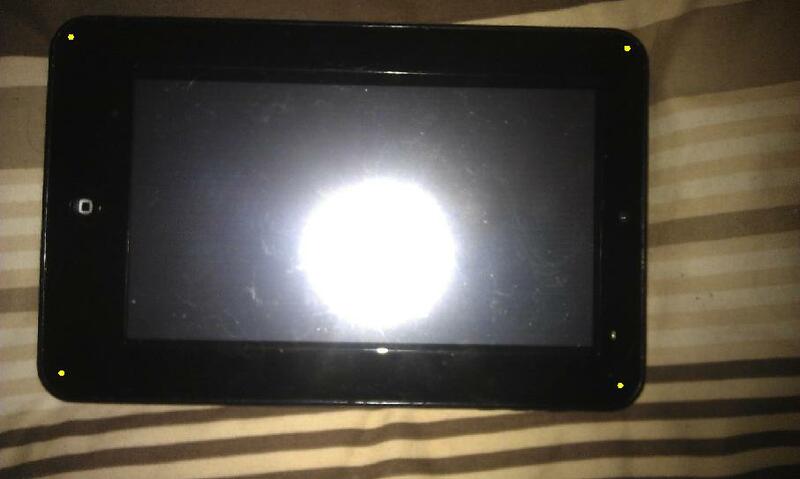 Step 4) Enjoy your new tablet with massively improved battery life!